Have you ever been caught in a rainstorm? Gotten splashed by a passing car? I am going to guess that yes, you have. Sometimes getting drenched is inevitable. Nothing is worse than going about your day with soggy shoes, wet hair, and damp belongings. Fortunately, getting wet unintentionally is universally hated, so we have galoshes for our feet, umbrellas and jackets for our heads, and waterproof backpacks for our belongings! The way we see it, there are two situations in which you might want a water-proof backpack – either you live in a rainy location or you are planning an adventure. Whether you are commuting in Seattle or white water rafting in Ecuador, we have got you (and your belongings) covered with one of these fantastic waterproof backpacks. Below are our eight favorite waterproof backpacks – four for every day use and four for adventuring. Your things will remain safe and dry no matter what the weather has in store. This bag was designed with commuters in mind. Not only is it made of a water-repellent nylon (which will protect your things from rain and snow), it also comes witits’s own theft-proof combination lock. It has an access point for a USB cord so you can charge your phone easily while using it during transport. It has three main pockets, and nine smaller inner pockets. Your things will stay organized and easy to find. It comes in five colors, so you can opt for something sleek and neutral or a pop of color. If you walk or ride to public transport for work, this is a great bag for you. This backpack is great for everyday use. It is made of a water-resistant polyester, and is lightweight at only 14.4 oz. You can wear it all day without worrying about back strain or pain. It consists of one main compartment with an interior laptop sleeve and a small external zipper pocket. There is also a slim water bottle sleeve on the side. It comes in nine vibrant colors, so you should have no problem finding one that matches your style. If you are planning a day hike, a lengthy shopping trip, or a day at a theme park, this is a great bag to have with you. This bag effortlessly combines fashion and function. It is made of high quality, water-resistant oxford material, and consists of four exterior pockets with magnet closures that resemble buckles. This pack promises to keep your style sleek and your belongings dry. The bag has lots of cushioning which provides lumbar support, and the adjustable, padded straps will fit nicely on your shoulders. 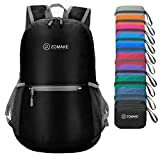 If you are planning a long day exploring a new city, but still want to look stylish, this backpack is the choice for you. This bag is made of a lightweight and water-resistant canvas, which gives you a classic look without sacrificing water wicking capabilities. One reviewer did a water test and found it to hold up well. This bag consists of the main pocket and a front pocket, has shoulder straps and handle straps on the top, and comes in six bright colors. 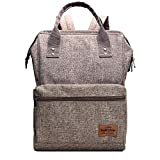 This is a great bag for students and commuters looking for a stylish, yet safe way to transport their belongings. 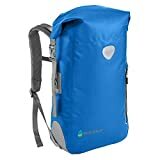 This backpack is made of water-resistant and tear-resistant material, making it a great choice for day hikes, camping, backpacking or even fishing. It consists of several compartments, which would allow you to separate your clothes from your food. The padding on the shoulder straps and back panel are thoughtfully placed to offer ventilation. This backpack even has a built-in water pipe access port for hydration packs. The next time you hit the trails, make sure this waterproof backpack is on your back. This waterproof backpack is made of ripstop nylon and a high-end YKK sipper, making it completely waterproof. It is super light, weighing only 4.6 oz, and can fold down into a pocket-sized carrying case. The main compartment closes by rolling the top of the bag down and then clipping the two ends of the rolled bag together – a common closure for waterproof bags. If you are going backpacking or camping and plan to spend a day out on the water either canoeing, kayaking, or rafting, then make sure this bag is somewhere in your luggage so that you can pull it out and fill it with the material you will need for your day-long adventure! This bag is made of water resistant and tear resistant material and folds down into a sandwich-sized carrying case. It consists of one main compartment, a front compartment, and two side water bottle sleeves. You can choose from eleven bright and vibrant colors, which will ensure that your backpack stands out in a crowd! This is a great bag to have with you on a boating trip, as it is light, easy to get in and out of, and durable. This backpack is essentially a waterproof sack with two shoulder straps. It is made of a vinyl-coated woven polyester, so you can feel confident that absolutely no water is getting in here. It consists of one main compartment, which folds over and clips to close, and one exterior zipper pocket for things you need to have easy access to. The shoulder straps and back panel are padded, and it comes in seven colors. 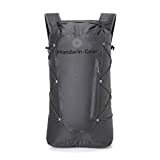 If you are planning a white water rafting trip or know that your hike will be plagued by rain, this waterproof backpack is a fantastic option for you. So pack up anything and everything you want to keep dry and hit the road. If you’re looking for a raincoat, check out this post.